The Fogg behaviour model is a psychological framework for encouraging people to make better choices and create new habits. The model is based upon research by Professor BJ Fogg at the Stanford Persuasion Lab and is focused on how to change behaviour using technology. The model is especially useful for developing ideas for conversion rate optimisation as it provides optimisers with a framework to explore reasons why a task may not be completed. The Fogg behaviour model explains how three elements must occur simultaneously for a behaviour to be completed. Fogg’s model suggests that behavioural change only occurs when users have the motivation, the ability and a prompt to activate the behavioiur. When a task is not undertaken at least one of these three elements must be missing. The Fogg behaviour model provides a framework for designers to understand what stops people from completing an activity and how technology can be used to alter behaviour. For example, if users are not completing a target behaviour, such as paying for goods in their shopping basket, the model would suggest that designers should explore shopper motivations (e.g. discounts & social proof), their ability to get through the checkout process (e.g. usability) and what prompts there are during the experience (e.g. call-to-actions). Fogg outlines three motivators; Sensation, Anticipation and Belonging. Each of these motivators has two sides; pleasure/pain, hope/fear and acceptance/rejection. If you want to encourage a behaviour people need to have the ability. This includes having the skills and knowledge to complete the desired action. There are two options here. We can either help people improve their skills or we can minimise friction by making it easier for people to undertake the activity. Onboarding tools are often used to help users quickly learn the skills needed, but this can be problematic as people are often impatient and lazy when visiting a new website or downloading a new app. Creating an intuitive interface that does not require any instructions or on-boarding assistance is often the better approach here. Money can also limit our ability to complete a task. If we set minimum thresholds for discounts or bonuses too high this can prevent many people on a low budget from participating. This often happens when organisations use average basket value or the average deposit amount as a guide. There is no such thing as an average user and so metrics based upon averages may be highly misleading because they are often heavily biased by outliers. Prompts help remind or direct people to start an activity. Without some kind of prompt the desired behaviour won’t be completed. Common prompts are call-to-actions, directional cues, requests and triggers. There are two kinds of prompts, external and internal. External prompts come from our environment. These can be things like a pop-up or push notification. Internal prompts come from our own behaviour and are triggered by our daily routine or habits that lead to a particular behaviour. Going to work for example can prompt behaviour such as reading a book on the train, buying a coffee at the station and going to your favourite sandwich shop at lunchtime. Certain life events such as starting work, marriage, moving home, birth of a child and children going to university are very powerful prompts for changes in behaviour and the creation of new habits. The Fogg behaviour model is a useful framework for conversion rate optimisation because it identifies three areas where optimisers can experiment to improve task completion. Optimisers love to experiment with persuasion (i.e. 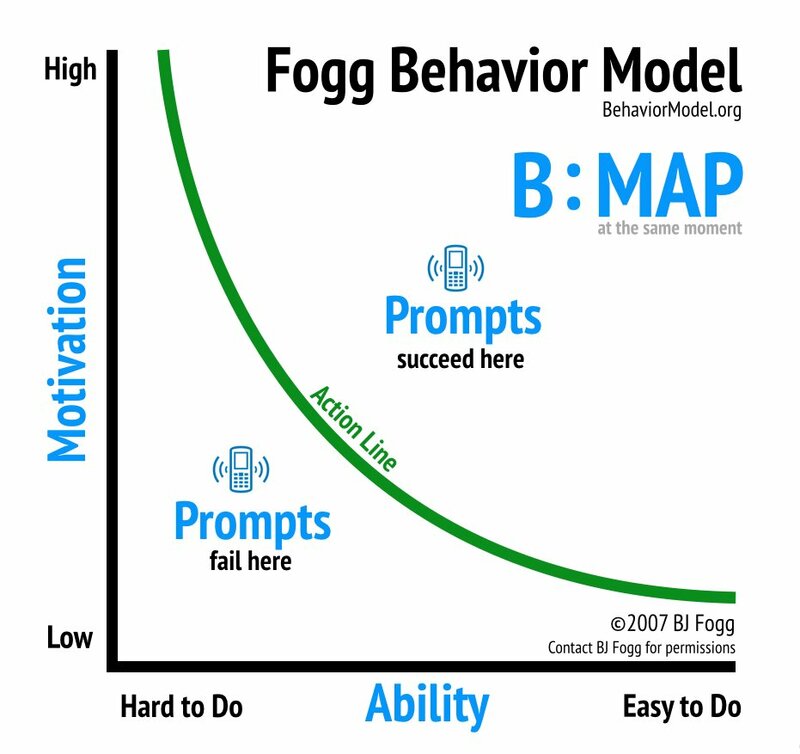 motivation) as a strategy for improving conversions, but the Fogg behaviour model reminds us that users also need both ability and prompts to complete a task. This demonstrates the importance of fixing your using experience before trying to run A/B tests to improve motivation or the prompts that result in the desired behaviour. For more examples of how to use the Fogg behaviour model you can check out the post; Why do most attempts at behavioural change fail? This examines BJ Fogg’s model in more detail and explores specific ways it can be applied to conversion rate optimisation. Using Fogg for conversion optimisation – Why do most attempts at behavioural change fail? Behavioural change frameworks – How to use behavioural science to create new habits.